The Sceptre S8 delivers a very balanced sound, with excellent imaging and a broad sweet spot. Broad sweet spot. Good tweaking options. Solid but controlled low-end. They're sizeable, so won't be for everyone (nor every space). 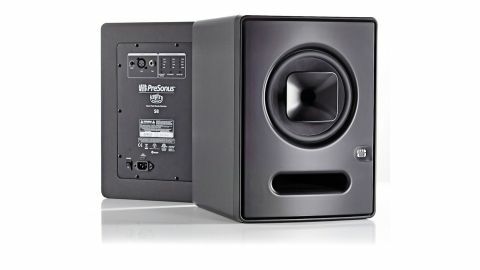 Presonus already has a very affordable two-way monitor range called Eris that follows a pretty well trodden path. However, for its new flagship range, Sceptre, it's chosen a slightly different route, developing a horn-loaded integrated coaxial driver design, which it's dubbed CoActual. "Coaxial designs are nothing new, but the Sceptre series employs onboard DSP to fine-tune driver performance"
Coaxial designs are nothing new, but, much like Equator's Q-series and D-series designs, the Sceptre series employs onboard DSP to fine-tune driver performance, and Presonus's chosen DSP option is called Temporal Equalization. The Sceptre range has just two models, the S6 and S8, and, apart from the different LF drivers (6.5-inch and 8-inch) and a few subtle differences in crossover and overall frequency response, they are very similarly spec'd. The S8s we have for review are pretty big monitors (11kg a piece), bridging the nearfield and midfield categories, and are clearly best suited to medium or larger sized spaces. The front is dominated by the integrated driver, which incorporates a 8-inch low- to mid-range driver with a 1-inch horn-loaded high-frequency transducer. Also note the slot-shaped bass reflex port and bright blue illuminated Presonus badge. On the back panel you get two input connectors (XLR and balanced jack), regular mains with power switch, and an input level control. Then there's the 'acoustic tuning' section, which includes an HF trim, a high-pass filter and an acoustic space setting to compensate for wall bass boost. All three options include a linear setting and three further settings with corresponding LED indicator, and you cycle through each of the options using their own selector button below. The acoustic space parameters are linear, -1.5dB, -3dB and -6dB, and the HF settings (shelving above 2kHz) are linear, +1dB, -1.5dB and -4dB. Finally, the high-pass filter is 24dB/octave and can be set to linear, 60Hz, 80Hz and 100Hz. Should you wish you can use all three acoustic space settings concurrently. Other features include class D amplification, RF shielding, current output limiting and over temperature protection. The amps also include soft start power on. So, back to Temporal Equalization (TQ). This system was developed by Dave Gunness of Fulcrum Acoustic, and Presonus has licensed it for use with their own CoActual drivers and purpose-built HF horn. TQ's DSP algorithms employ various filters including infinite and finite impulse response types, including the time domain (temporal) filters that give it its name, and this allows it to eliminate the inherent horn reflections that normally haunt this sort of coaxial configuration. So, that's the science, but how do the S8s sound? We were surprised by how balanced the sound was straight out of the box with all controls set to linear, and although after some testing we opted to tame the HF with -1.5dB and set the room acoustic space setting to -1.5dB, this was purely a matter of taste. It has a sweet top-end that's detailed without being too harsh. And the bottom-end extension is good and tight, so shouldn't cause many problems even if your room isn't heavily treated with bass traps. The sweet spot, both vertically and horizontally, is quite broad, so you can happily sit a bit off axis and not be unduly disadvantaged. This is coupled with a detailed mid-range, which feels a little upfront, but doesn't dominate. The class D amps deliver plenty of power, and the internal heat sink configuration and class D operation means minimal heat dissipation at the back. The S8s sound easily as good as a comparably priced twin driver design, and should probably be auditioned alongside more expensive options. They are still pretty large monitors though, which is also a consideration.